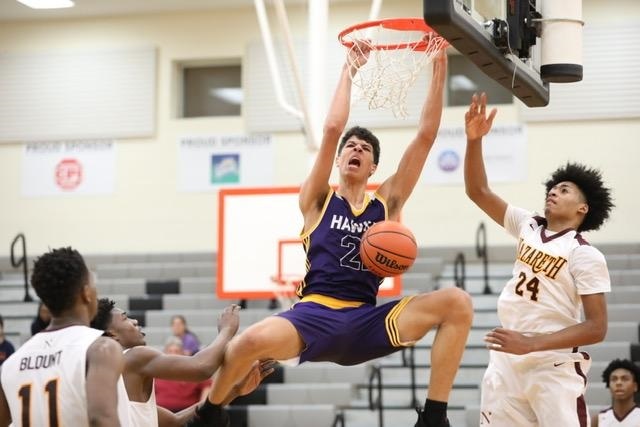 HOLLY SPRINGS, N.C. – Kadin Shedrick’s 6-foot-11 height singles him out, but a portrait of him that is broader than his big-time college basketball recruit identity is found elsewhere on his public school campus. He could be 5-11 and stand tall. Off the court, the larger picture is of him supporting a student body segment historically overlooked – special needs students. On the court, the Holly Springs High senior is known at the suburban Raleigh school for a scholarship from national power Virginia. He averages a double-double of 17 points and 11 rebounds with four blocks a game. The Golden Hawks (19-4) begin N.C. High School Athletic Association 4A playoffs on Thursday after a first-round bye. But pull back the basketball microscope at the school's 2,000-student campus. Watch Shedrick with a wider lens visiting the classroom of Holly Springs teacher Samantha Churchill and her students with autism. American campuses – elementary, middle and high school – need kids like Shedrick to stand out. “It’s important for other students to see him around them,” Churchill added. “He’s this star athlete, well-known on campus. Other kids see him smiling, having fun with them. They see they’re his friends. He makes it cool. There is a “one-of-the-guys” symbiosis to Shedrick and special needs students – kids with disabilities ranging from autism to intellectual and physical disabilities. With them, he can step away from shouldering national recruit expectations and drawing stares for his height. He’s one of the guys – as if he was 5-11. The past couple decades or more has seen a national philosophical shift in special education. Students with disabilities previously were isolated in “special education” classrooms. The separation policies attached a stigma to them. The modern goal is to mix their day with the general student body when appropriate. Teachers, on-campus administrators and staff work tirelessly at the task, even though more resources are always needed from state legislatures that fund public school education. Shedrick isn’t alone on his campus and other schools have special students volunteering in special needs classrooms, but his prominence shines a brighter light that can reflect on all of them. He began engaging special needs kids on his own initiative while attending Holly Ridge Middle School. His parents, Dominic and Cindy, were unaware until visiting the school for their daughter Kari’s activities. Last spring, Shedrick worked with Churchill’s students on a recycling project through a student leadership class led by Holly Springs basketball coach L.J. Hepp. On Tuesdays and Thursdays, he joined Churchill’s students while collecting recycling materials from hallways and classrooms. That was a classroom activity, but he seeks other outlets, too. This school year teammates Garrett Phillips, Matt Willadsen and Ben Goetsch have joined him on classroom visits. Shedrick and Phillips participated on Feb. 16 in a North Carolina Special Olympics fund-raiser, the Polar Plunge, into frigid Jordan Lake. Project Unify and Club Unify are other Special Olympics school related events. Another off-campus activity is Spirit League Basketball, a budding North Carolina non-profit based at the Apex Community Center. Shedrick runs kids through drills and games in the adapted special needs league that is similar to Miracle League Baseball. During Holly Springs’ basketball season, the Golden Hawks hosted a Spirit League game at halftime of a contest. Hepp had his team remain courtside to encourage the players rather than taking them into the locker room for chalk talk. Basketball, though, does come up as a topic in Churchill’s classroom. Another student has memorized the CBS television schedule. To connect with non-verbal autism kids requires more patience, but that hasn’t limited Shedrick and Phillips from bonding. Churchill cites one of her non-verbal students using a “talker,” a communication tablet with buttons to express recorded words. Autism students are on different levels of the spectrum, so some have unexplained outbursts of anger verbally or physically. Shedrick and Phillips haven’t backed off. Shedrick’s attitude to excel is at the core of his personal basketball strides. He has gone from awkward middle school backup player still growing into his body to an elite college recruit. He grew to 6-2 as a freshman, 6-8 as a sophomore, 6-10 as a junior and now 6-11. His coordination began catching up as a junior, but he might have emerged earlier if he wasn’t so young for his class. He doesn’t turn 18 until July 27, more than a month after graduation. That helps explain his breakout not arriving not until he senior year. However, it also projects his college ceiling as higher, topped by his doctor believing he might have another growth spurt to 7-1. Hepp, who is in his first year as Holly Springs’ coach after being hired in the spring of 2018, was aware of Shedrick when he took the job. He was the athletic director at nearby Panther Creek, but he wasn’t the only one surprised by Shedrick’s leaps and bounds last summer. Entering the summer Shedrick’s recruiting offers were largely limited to smaller schools until midway. At a California summer AAU tournament, while playing for retired NBA player David West’s Garner Road team, Shedrick triggered a national trip wire. Recruiting spotlights lit up. 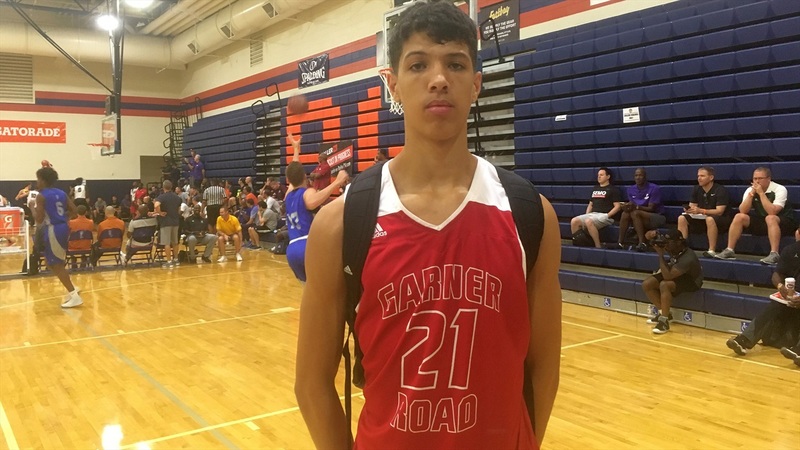 He was up to 25 offers, with Virginia atop a final eight that included Wake Forest, Louisville, Florida, Wisconsin, Indiana, Xavier and Providence. Other academically elite schools to offer were Georgia Tech, Northwestern and Georgetown before Shedrick ended the process. He gave the Cavaliers his verbal commitment in late August and signed in the early November period. 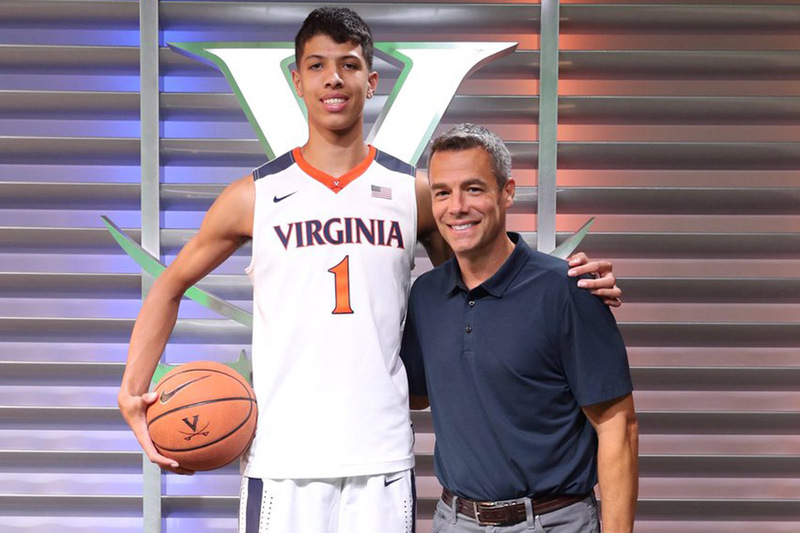 Virginia coach Tony Bennett’s reputation for developing late bloomers into NBA prospects attracted Shedrick. So did the demanding academics at Thomas Jefferson’s Charlottesville campus. He is in the top 10 percent of his class and considering a major in a math field. There are plenty of Virginia names that have developed under Bennett, but the one Shedrick related to was Jay Huff from Durham Voyager Academy, a charter school close to home. Huff, the Cavaliers’ 7-foot-1, 232-pound redshirt sophomore, was a 6-11, 190-pound senior in the recruiting Class of 2016. In high school, he held his own in a 2015 state playoff game against Bam Adebayo, a 2017 NBA draft one-and-done out of Kentucky. The long view is paying off for Huff after he redshirted his first year at Virginia. He is contributing important minutes off the bench, with season highs in a game against Marshall of 14 points, eight rebounds and two assists. He also had a season-high of three blocked shots against Morgan State. He had 12 points and seven rebounds and two blocks in a 64-52 win on Saturday at Louisville. In a January homecoming game against Duke’s NBA lottery picks, he put down an impressive dunk on a break from the 3-point arc at Cameron Indoor Stadium. Blue blood Schools like Duke and North Carolina can sign 4-star recruits that already have the weight of an NBA prospect, but a program like Virginia relies on coaching up 4-star talent that needs time to mature. The football comparison is a school like Duke signs linemen that can grow into a 300-pounder, while Clemson signs 300-pounders coming out of high school. Huff and Shedrick hailing from the Raleigh-Durham area is coincidental, but Virginia’s coaching staff was quick to pick up on both. Shedrick, listed at 200 pounds, says he is comfortable redshirting if that’s Bennett’s recommendation. “The comparisons between them are similar that they both had to gain weight and get stronger,” Williford said. “Jay is still a work in progress in that regard. Kadin will have to come in and attack the weight room to work on his body filling out and then getting more physical. Shedrick met Huff on his recruiting visit and discussed Bennett’s development coaching skills. He also returned home learning two inches separating 6-11 and 7-1 can be imposing. 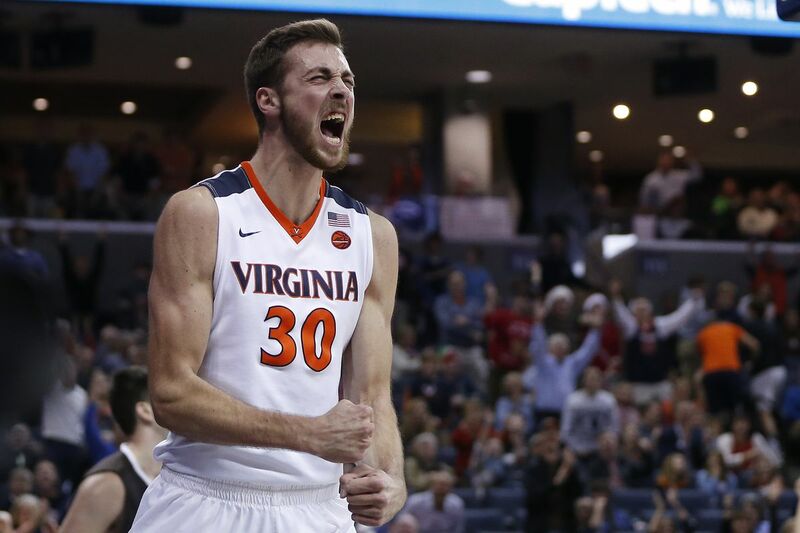 Might Virginia be able to play 7-foot Twin Towers? “I don’t see why we can’t get Kadin and Jay in there together,” Williford said. “Teams present challenges when they play small ball, but at the same they have to adjust to two bigs on the floor. We can play two bigs if they can slide their feet and move with quicker players. “Potential” is an albatross for an athlete lacking worth ethic, but Shedrick has demonstrated both desire and an adaptability. Baseball was his first love; the diamond sport runs in the family. His sister Kari is demonstrating college softball potential as a Holly Springs sophomore. She stands 6-0, but so far growth spurts aren't pushing her off the diamond to the hardcourt as they did Kadin. He was a 6-2 freshman first baseman on the Holly Springs JV team while playing in veteran baseball coach Rod Whitesell’s talented state-power program. Chicago White Sox pitcher Carlos Rodon led Holly Springs to North Carolina’s large-school state title as recently as 2011. Whitesell saw "Division I college baseball potential" in Shedrick's lone season. "He was still growing into his body, but I always felt he had excellent baseball potential," Whitesell said. "He had tools. He was very good. He could hvae been on the mound, too. He had a live arm." Long-time area baseball instructor Tom Hayes, who has helped develop future Division I and Major League Baseball players at Hit and Run, Inc., his Fuquay-Varina facility, also saw potential. But with each growth spurt, he told his parents he saw baseball losing its grip on their son. The height and baseball/basketball connection brings to mind Tony Clark, the MLB Players Association executive director. Although Clark played 15 MLB seasons as a 6-8 first baseman and designated-hitter, he was better known in high school as a highly recruited college basketball prospect until the Detroit Tigers made him the second pick of the 1990 MLB draft. Clark added his basketball/baseball double growing up was good for developing his overall athleticism, a contrast to this age of specialization at younger and younger ages. Shedrick’s ability to refocus his potential from the diamond to the hardwood required time, but leaving home for a basketball academy wasn't a path. He has contributed to his school and community, even though in the process he has inadvertently provided a scouting report for Holly Springs’ opponents. One day after running the Spirit League special needs kids through drills and games, he and his Holly Springs teammates squared off for a contest. The Big Man on Campus sees and paints the bigger picture.